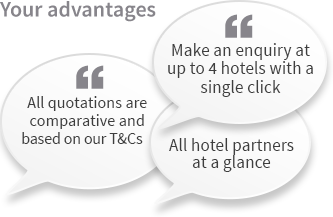 Register your hotel - acquire new customers! You would like to register your hotel now - an excellent decision! By registrating, your hotel on conferencehotel.com, you can secure your competitive advantage right now! Enter your data into the following entry fields. It is mandatory to fill in the fields marked in orange . Then click on “PRINT“ to get your registration form. Please send this form with your signature and stamp by fax to us. The contract does not become valid until we receive your registration form by fax. Within a maximum of 5 workdays, your hotel will be online on our portal. By registrating, you agree with the general terms and conditions of our terms and conditions .